The Eastern branch has opportunities for officers and committee members for the 2018-2019 year. The 2018-2019 Board will be installed at the monthly luncheon on October 18, 2018, at the NCSU University Club. Please reserve this time in your calendar to attend if you plan to apply for a position. All applicants will be notified no later than October 16 with the election results. The Branch is seeking a President-Elect. The term for this position starts in October, 2018. Please nominate yourself or other Members for officer positions using the online form. Please be sure to have your ASCE member number available for the registration form. Officer nominations will be accepted until 5:00PM on Friday, October 12, 2018. The Branch is also seeking volunteers for Branch Representative, Community Relations / E-week Coordinator, and Fundraising Chair. If you are interested in starting a new committee, you can indicate that as you sign up as well. Please nominate yourself or other Members for officer positions using the online form. We’ve prepared a PDF detailing these openings and their duties. Thank you to everyone who volunteered for our Summer Stream Cleanup on the morning of June 9, 2018! Solid turnout from ASCE North Carolina State University and Duke ASCE! We received a message from Brentwood Elementary. It's absolutely incredible. We can't wait to do this again next year! Each year, ASCE gives members the opportunity to share their passion for civil engineering with students at local elementary magnet schools. 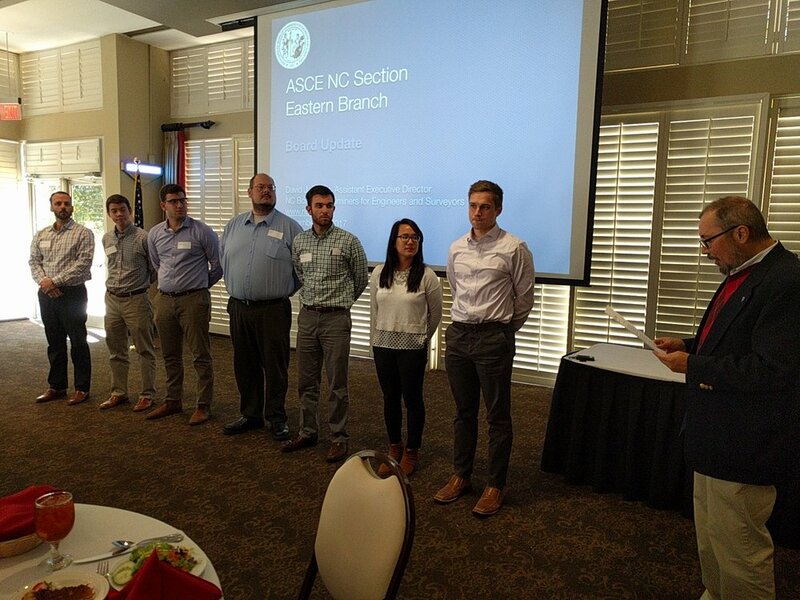 ASCE has partnered with a few schools in the past by sending ASCE professionals to present to one or more classrooms about civil engineering. ASCE provides you with materials and can offer suggestions on what to present. The time commitment is small - just a couple of hours on a morning or afternoon on a day of your preference (subject to availability with the school). Right now, exact dates are not known, but possible weeks are February 19-23, February 26-March 2, and March 5-9. If you are interested, please see the link below for more information and to sign up. RD Odell honored us by installing our 2017-2018 officers at our November 16, 2017 luncheon at the North Carolina University Club. If you're interested, please reach out to our branch's president, Christine Herrick, at christine.herrick@kimley-horn.com. Also, NCSU Dean of Engineering, Louis Martin-Vega, wrote a letter that highlights the importance of this middle school outreach program. The Eastern branch has opportunities for officers and committee members for the 2017-2018 year. The Branch officer positions available are for the President-Elect and Treasurer, which begin in October. You can use the online form to nominate yourself or other Members for officer positions. You'll need your ASCE member number in order to complete the registration form. Officer Nominations will be accepted until 5:00PM on Friday, September 15, 2017. Community Relations / E-week Coordinator, and Fundraising Chair. If you are interested in starting a new committee you can indicate that as you sign up as well. Use the online form to express interest in serving as a member of a committee.